Lately, I've been loving Fiddlehead's Hodad porter (and Long Trail's Limbo IPA, but that's another story), and after drinking a couple the other night, it dawned on me that this porter also has excellent marinating potential. I'd been waiting for the right night to grill a package of semi-boneless quails from Cavendish Game Birds of Vermont, and suddenly the moment was right. And although the quail is a delicate, lightly sweet-tasting bird, the sweet, malty, coconutty flavor of the Hodad makes a beautiful complement. 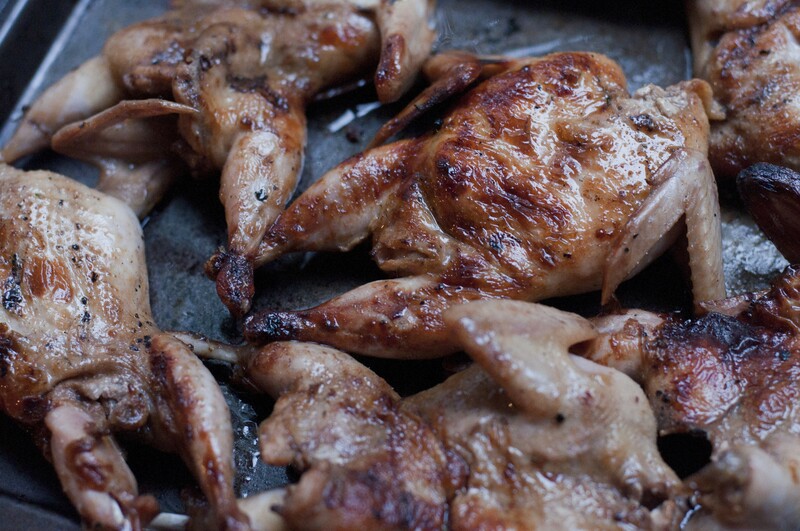 Served one per person, these little fire-roasted birds make a finger-licking first course. Throw two or three on a plate and they make a formidable entrée. Remove the quails from the package, rinse thoroughly, and pat semi-dry. Place in a large bowl or plastic container. Whisk ingredients for marinade until they're thoroughly combined. Pour the marinade over the quails, turning birds until they're thoroughly coated, stirring occasionally. Marinate at least 30 minutes but not much more than a couple hours; quail meat absorbs flavor quickly and you don't want the marinade to overpower the fine flavor of the meat. When you're ready to cook, light the grill and allow to heat to 400-450 degrees. You can use an oven if you prefer, but the grilling adds smoky awesomeness and I recommend you try it. Place the birds on the grill and roast, covered, for 5 to 7 minutes. Flip the quail, replace the cover and allow to roast until the skin is a delicate crisp. Let rest 2-3 minutes before serving.